I am so behind the curve on so many things in fandom. Probably because I spread my interests too thin. Every month I seem to bounce from one nerdy interest to another without rhyme or reason. Because of this I am so far behind on certain things that should be part of my nerd cred. The one major geek past time that I have seemingly left behind is comics. I have picked up a book or two every now and again for the past five years just to see whats happening with my favorite characters (Ultimate Spidey, Deadpool, Batman, X-Men). But past that I haven't delved into comics as much as I had in high school (i.e. 10 years ago). So I decided to take the plunge over the last month and follow "New Avengers" from issue #1 until the end of the run, along with all the epic event comics in between. I completed the task, and then some. I ended up branching off and reading most of the new Captain America run, all of the Dark Avengers, most of the Mighty Avengers, and then finally (and what brings me to this article) Spider-Man. Like many casual comic fans, I am a massive Spider-Man fan. He is easily my favorite comic book hero of all time. No contest. My twenty pairs of Spider-Man boxer shorts can testify to that. 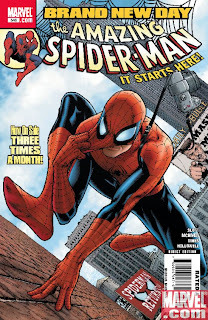 However, I haven't read Amazing Spider-Man consistently since the Clone Saga. That plot put a bad taste in my mouth, and I think started a curse with the series that permeated for years. Every few years I would pick up "Amazing" in hopes that the series found its footing again. When I picked up the horrendous Gwen Stacy Cuckold storyline, I realized 616 Spider-Man was probably dead to me. Luckily I found my saving grace, Ultimate Spider-Man, which although I haven't kept up with it in the past couple of years, I followed that fantastic story from issue one until Mark Bagley left. The problem with Ultimate Spidey is that the story and characters are the best in comics, but it is stuck in the now horrendous Ultimate Universe that Super Skrull, Jeff Joeb, set out to destroy. If only Ultimate Spidey existed in the normal Marvel Universe. The-Powers-That-Be at Marvel realized that and sought to make 616 Peter Parker more like he used to be, down on his luck, broke, and single. Joe Quesada, Editor-in-Chief at Marvel, infamously stated his distaste for Mary Jane and Peter's marriage. People thought this meant he hated Mary Jane. This isn't true. He realised, that Peter is at his best when the world is against him. Having him married to his true love and living off her millions is hardly the every day character people can relate to.S omething had to be done to get Peter back to someone readers could identify with, and thus "One More Day" started. If you are reading this article this far, then I probably don't need to go into details about the controversy surrounding "One More Day" featuring Peter Parker literally making a deal with the devil to make it so his marriage never happened. At the time it happened I felt it was probably one of the worst ideas I've ever heard of in comics, and I still feel that way. There was a million and a half other ideas that could have gotten the same results as the One More Day storyline that wouldn't involve Peter doing something as unforgivable as nullifying his marriage to save his dying Aunt, using the Devil. Hell, they could have made Dr. Strange find some kind of book that would save his Aunt in return for something equally as precious to him. Even that would have been forgivable. By using demons it makes it unforgivable. For all intensive purposes, for me, that was the end of Spider-Man. The character created by Stan Lee and the story that began back then ended in tragedy when Spidey made that choice. That's all folks. But from that we now have a brand new Peter Parker that is completely separate from the one that sold his soul, with the "Brand New Day" that puts Peter back to his humble beginnings. I fought like mad to not read this book. I tried so hard to stick to my guns of never reading a 616 Spidey title ever again, but as I read New Avengers and saw Spidey wisecracking and being his old self, I remembered why I loved the character and couldn't resist just seeing what was happening in "Amazing Spider-Man". And I hate to admit it, but so far, I'm loving it. It really is what Spidey has been missing all these years. Watching him struggle to keep his head just barely above water is what makes a Spider-Man book work. I'm not going so far to agree with Joe Quesada that it is all Mary Jane's fault. After all, in Ultimate Spider-Man, Mary Jane and Peter have been a couple for 75% of the book, and it works just fine having them together. Good writing can make any relationship work. However, for whatever reason they just couldn't get it to work in the regular universe, so the Reset button was pushed and we have this "Brand New Day". It also helps too, that the Peter Parker in the regular Marvel Universe is now my same age, so that alone lets me relate to him better then the Ultimate Peter in High School. However, I just recently got married, so I can't really relate to his swinging bachelor lifestyle anymore, but I'm still enjoying watching him trying and failing at relationships. Who knows if they can keep the steam going with Spidey now. For the sake of the character and franchise I sure as hell hope so. Otherwise I say the next step is kill him off completely and transplant Ultimate Spider-Man into the regular Marvel Universe.